Almost three years ago, I was going through two big changes in my life. The first was one many people go through: I’d just graduated from high school and was preparing for move-in day at the University of New Hampshire. The second was a bit different: In college, I’d be using a power wheelchair for the first time. So during my last summer vacation before college, my parents and I picked a day to visit a local store that sells wheelchairs, so I could try out some chairs. I was ready to learn all about the wheelchairs so I could make a good decision. I wasn’t expecting to learn something about them that would change my life. We went into the store and met the salesperson who would be helping us, and she started showing us the various kinds of wheelchairs. I had no trouble driving any of them, since I’ve been playing video games for as long as I can remember. During all the driving around and switching between different chairs, there was one wheelchair that kept catching my eye. It was different from the others because it had a weird metal cage thing attached to it, right in front of the footrests, and next to it was a soccer ball that looked twice the size of a normal one. I didn’t really know what to make of this, but as a big sports fan, I was definitely interested. At some point, I asked the salesperson what the chair was for, and she explained that it was for playing Power Soccer, a sport designed specifically for power wheelchair users. Even better, she then told me there was a team based at the University of New Hampshire. What a coincidence, right? The existence of a sport played in power wheelchairs was significant for me in a couple of ways. At that time I’d become a huge soccer nut. I watched soccer, followed soccer news, played soccer video games, and now I had the chance to actually play soccer. This was also great because, due to the nature of my disability, I’d played on sports teams since I was old enough but had to stop when I was 12 because it was too difficult. Now I could play again. It was exciting. It gave me something to look forward to once I started using a wheelchair, which made it easier to make the transition. Soon after that day at the store, I sent an email to the coach of the Northeast Passage Power Soccer team, and she put me on the mailing list for the team and told me they would have a chair for me to use when practices started. A couple of months later in October, I was playing my first Power Soccer games, and the team earned our first win of the season. We had a great group of players, and I had a blast, which is still true halfway through my third year on the team. In that time, I’ve played with and against many great people, from kids as young as 8 years old to adults older than my parents, with a variety of disabilities. Despite our challenges, we’re all athletes, even though we rely on an expensive combination of metal, wheels and electronics to get around. Hey, if NASCAR drivers are athletes, so are we! Power Soccer changed my life, and I think it changes the life of anyone who gets a guard bolted onto their chair. Many people in power wheelchairs may think they cannot play a sport. 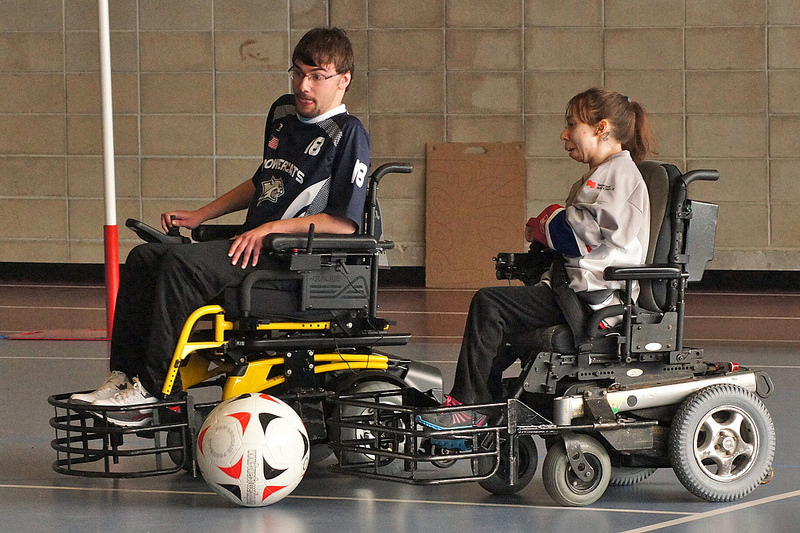 Power Soccer is a great way for anyone in this situation, young or old, to prove that thought wrong. There are more than 60 teams practicing and playing across the United States and even more around the world. If Power Soccer sounds interesting to you or someone you know, I encourage anyone to get on a court and become an athlete. Powersoccerusa.org is a great place to find an existing team or learn how to start one. Anthony Jennings, from Londonderry, New Hampshire, attends the University of New Hampshire, where he studies chemistry and plays Power Soccer on the weekends. He loves sports, reads science fiction and listens to Rush and Daft Punk. He has Becker Muscular Dystrophy and uses a power wheelchair, but he tries not to let that get him down or in the way.